Yesterday I was photographed by artist friend Rob Mills for a series he’s currently doing on women artists. Like many people I dislike having my picture taken, let alone when I’m working, but I’m pleased to share some of the images which capture something of me, my work and process. I had such a good time at the Ely Cathedral Christmas Fair! Thanks so much to all who visited my stand in the Lady Chapel, to my fellow exhibitors and to the organisers. One viewer pointed out how the shapes in the etching complement the shapes in the architecture. I like that and I truly love this inspiring building. The array of artistic techniques that Melanie Goemans utilises so masterfully in her work is driven by her academic grounding in art history and her continued investigation of different mediums. The resulting artwork portrays Goemans’ exceptional technical prowess and her interest in exploring the transient beauty of the everyday that exists in nature and her immediate surroundings. Melanie Goemans studied Florentine Renaissance art at The Courtauld Institute of Art and Fine Art at the University of Gloucestershire, followed by teaching and taking up art residencies in Cheltenham, Devon and London before settling in her current studio in the cathedral city of Ely. The wide, flat fens of the surrounding countryside influence the style and subject matter of her work. The soft, atmospheric tones of her paintings are slowly rendered with broad strokes and delicate brushwork onto a smooth gesso surface. Out of the diffused light, deep shadows or highlights with gold and silver leaf are used by Goemans to define and reflect elements. 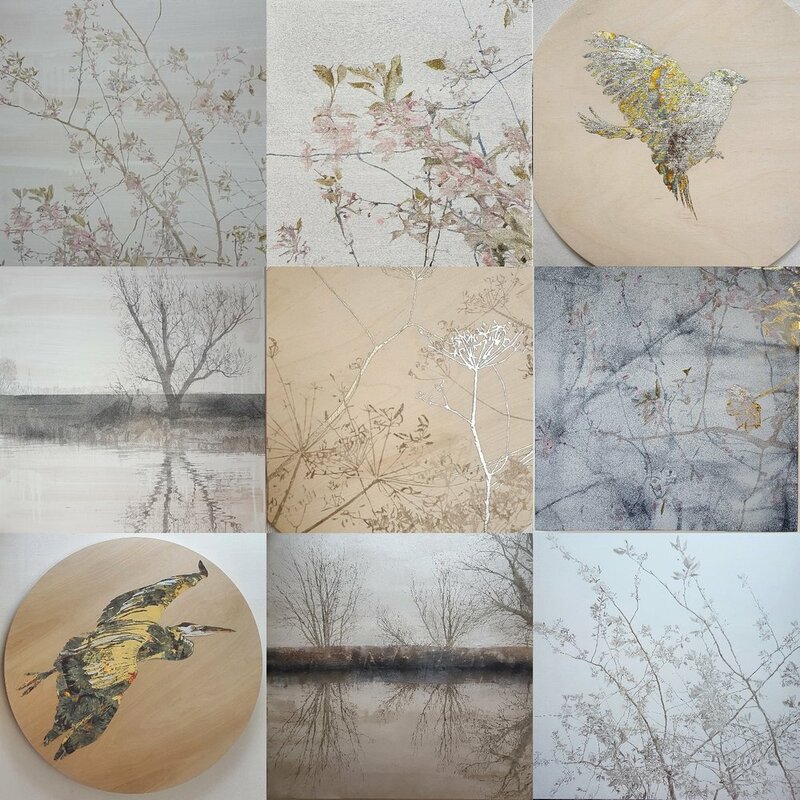 In this way, she uses age-old materials and techniques in painting and printmaking to create muted, modern depictions of the natural world and to draw us into a timeless one. Hello and thanks for all the interest in my show Tree. Bird. Stone. that opened today. I'm thrilled to share these installation shots of the work in the gallery setting accompanied by sculpture by Antonio Lopez Reche. A beautiful arrangement by Cornwall Contemporary. My solo show, Tree. Bird. Stone. opens tomorrow at Cornwall Contemporary! Please enjoy the exhibition catalogue below, including an invitation to the private view on Saturday afternoon. The full catalogue of 32 paintings can be viewed here. Melanie Goemans - Tree. Bird. Stone. Thrilled that my painting River Great Ouse (Elegy II) has been selected for the special Art Issue of Homes & Antiques on sale from today. It includes a 'smart art guide' supplement - my work is on page 9 🌞 Many thanks to Charlotte Packer, Katherine Kittoe and all at Homes & Antiques. THANK YOU to all my open studio visitors over the past 2 weekends ... for braving the heat, missing the football; for all the feedback, comments and purchases. It was good to welcome some interesting new people as well as return visitors from previous events. Thank you all. a solo exhibition of paintings at Cornwall Contemporary, Penzance 29th August - 22nd September. Melanie's sensitive and subtle paintings have been exhibited at the gallery previously to great success, where her pared down, almost shadow-like floral paintings were bought avidly by collectors, and this is the first time all of the gallery walls will be devoted to Melanie's paintings. Accompanying, will be a small collection of bronze figurative work by renowned Spanish sculptor Antonio Lopez Reche. I'm delighted that my etching 'Cuckold's Row' has been selected out of all the very many images held globally by the Bridgeman Art Library for the cover of this significant book: 'Waiting for the Last Bus' by Richard Holloway, published last week by Canongate. Two new etchings made at the Curwen Print Study Centre on Saturday, now drying in my studio. The festive season of fairs and shows started wonderfully last week at the Ely Cathedral Christmas Fair. Thanks to everybody who visited my stand in the Lady Chapel. It was great to see familiar faces from my open studio, as well as meet so many interesting new people. My next local event is my Christmas Open Studio on 2nd and 3rd December, 11am-6pm, CB7 4AA. As group exhibitions at Cornwall Contemporary and Josie Eastwood come to a close this weekend (25/11), the Winter Exhibition at The Stratford Gallery opens, including several large paintings from my studio. In addition, 15 - 16 December twist art are taking a selection of etchings to the Christmas Market at Soho Farmhouse Members Club in the Cotswolds. If you are unable to make these events, don't forget that work and products made using the designs can be bought and posted from my studio. Or, if you're local, you can buy from the National Trust shops at Anglesey Abbey and Wicken Fen, and from the 'Eel Catcher's Daughter' on Ely High Street. A joyful and beautiful new collection opened today at Cornwall Contemporary ... Can you spot my painting 'Summertime' in this picture?! 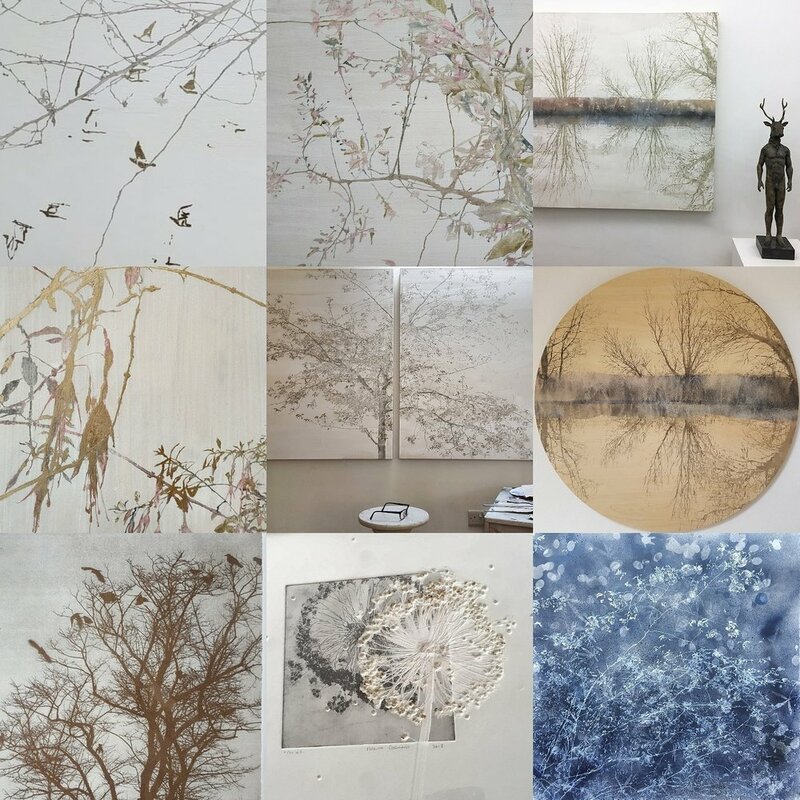 Artists include Ele Pack, Neil Pinkett, Jessica Cooper, Emma Jeffryes, Melissa Kiernan, Antonio Lopez Reche, Melanie Goemans, Janet Lynch, Maggie Matthews, Kristin Vestgard, Alasdair Lindsay, David Mankin, Ken Spooner, Philip Lyons, Daphne McClure, Claire Loder, Emma McClure, Caroline Pedler, Emma Dunbar, Sarah Dunstan, Philip Lyons and others.